Square feet area of platform is determined by net inside area. • Class A (General Freight Loading) — 50 lbs. per sq. ft.• Class B (Motor Vehicle Loading) — 30 lbs. per sq. 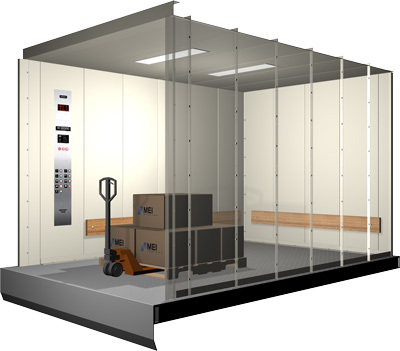 ft.• Class C-1 (Industrial Truck Loading – truck carried by elevator) — 50 lbs. per sq. ft., but not less than load, including weight of truck. loading and unloading not exceed 150% of rated load. • Class C-3 (Other loading with heavy concentrations where truck is not usually used) — 5 – lbs. per. sq. ft., but not less than load. MEI cabs are manufactured using 14-gauge steel. Standard wall panels are 24″ sections for ease of installation. Powder coat finish is available in a wide range of colors. #4 Stainless Steel finishes is also available upon request. Wall bumpers are available in wood, steel and stainless steel. Fluorescent lights are recessed into the canopy. Finished floors are available in a variety of materials, including checkerplate steel and hardwood. Ceiling and wall panel seams match on standard 24″ panels. Each cab is custom-built based on project requirements. Doors and gates from all major suppliers can be accommodated. Wall panels are interchangeable for ease of installation. Canopy panels are interchangeable for ease of installation. Wall and canopy panels are individually replaceable if damaged.